To solve a problem, sometimes you need to think outside the box. In this case, premier hand tool brand GEARWRENCH actually went and built a better box. GEARWRENCH, part of Apex Tool Group, recently unveiled its new Mobile Work Station, built to address common pain points from plant maintenance professionals across a wide range of industries. The innovative design blends practical functionality and durability with customizable features that give professionals the freedom to make the Mobile Work Station work for them. "One of the things you notice in working with maintenance professionals is that often times, their boxes are being used in a way that's far from what they were initially designed for," Paul Steinweg, Director of Marketing, said. "So, we wanted to create something that anticipated and met those needs in advance." The GEARWRENCH Mobile Work Station glides on industrial grade 6x2-inch-wide polyurethane locking casters that support a max capacity of 2,000 pounds. 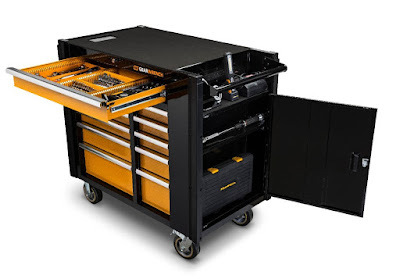 With 11 different-sized drawers—including a full-size top drawer with adjustable partitions—and a lockable side cabinet with adjustable shelf, the 19,000 cubic inches of storage space is flexible to fit whatever tools the job needs. The drawers boast 100-pound capacity ball-bearing locking drawer slides. The station is large enough to function as a work space complete with vise-mounting capability, but at just 24.5 inches deep, it's compact enough to roll through most standard work areas. With a charging tray and power strip with six 120-volt outlets and two USB ports, users can charge tools and power electronic devices that might be needed. A spray can shelf and pegboard panel offer even more options for customizable storage of tools, power cords, hoses, and more. GEARWRENCH is a premier hand tool brand from Apex Tool Group. Since the launch of the original five-degree ratcheting wrench, the GEARWRENCH brand has led the industry with breakthroughs in pass-thru ratchets, sockets, screw/nut drivers, pliers, and specialty tools. For more information, visit gearwrench.com. Apex Tool Group, LLC is one of the largest worldwide producers of industrial hand and power tools, tool storage, drill chucks, chain, and electronic soldering products. Apex serves a multitude of global markets, including automotive, aerospace, electronics, energy, hardware, industrial, and consumer retail. For more information, visit apextoolgroup.com.